We all know that a crooked smile causes you to feel self-conscious. Many people feel a beautiful smile is important for how you view yourself and how others view you, but did you know a straight smile is also important for your oral health? Alignment issues with the teeth can negatively impact your oral health, leading to potentially serious complications if the teeth aren’t moved into their correct position. We want to see you smile while having the highest level of oral health. We encourage you to fix your crooked smile to advantage from the numerous oral health benefits associated with straighter teeth. Healthy Gums—Large spaces in the teeth or overcrowding causes caring for the spaces between teeth to be more difficult. As a result, gum disease can develop, causing pain, inflammation, and even tooth loss. By fixing the spacing of the teeth, the gums seal the teeth, reducing the risk for gum disease. Improve Oral Hygiene—Crowded teeth are difficult to care for, especially when they overlap. This causes bacteria to become trapped between the teeth, causing tooth decay and gum disease. Properly aligned teeth are easier to clean for healthier teeth. Prevent Tooth Injuries—Protruding teeth that are misaligned are more prone to injury when an accident occurs because they will take the brunt of the force. Properly aligned teeth have a higher degree of protection in the event of an accident. 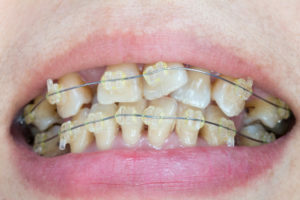 Reduce Abnormal Wearing of the Teeth—When your teeth don’t align properly, it causes certain areas of the teeth to suffer from abnormal wearing. Overtime, this causes damage to enamel. With the proper alignment of the teeth and bite, you’ll have healthy function of the teeth to preserve enamel. Promote Overall Health—Oral health is directly linked to your overall health. When gum disease and tooth decay are present, the bacteria in the mouth can lead to additional infections in the body. Not to mention, there’s an increased risk for certain cardiovascular conditions. Improve your overall and oral health with a straighter smile. Give Your Self-Esteem a Boost—When your teeth aren’t straight, you often hide your smile or feel uncomfortable when eating and speaking. With a straighter smile, you won’t have to hide any longer. You’ll have a confident smile you’ll want to show off. We offer a number of procedures to straighten the appearance of your smile. After a consultation, we’ll create a customized treatment plan to resolve alignment issues for a straighter smile to decrease oral health complications. Contact us today for a new smile.